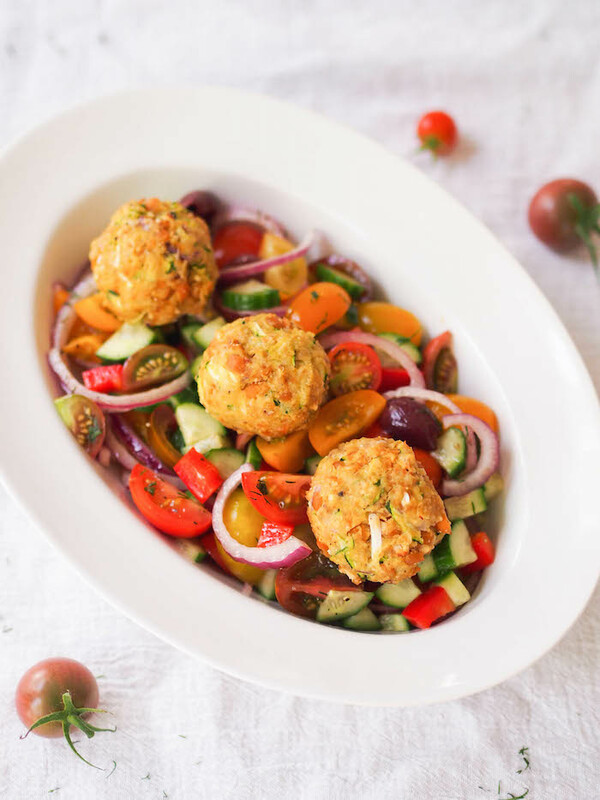 Highlight summer produce with this month's Recipe Redux Recipe - zucchini chickpea balls with chopped Greek salad! Hi kids! 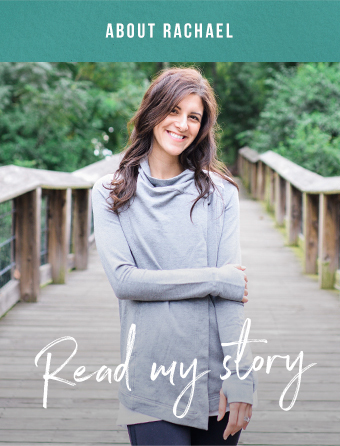 Today is Recipe Redux, so you'll be getting a bonus recipe this week PLUS because I got a little carried away with the theme, a recipe roundup! This month's theme is Fresh from the Garden, highlighting summer produce from the farmer's market, CSA or, as in this case, my backyard! When we bought our house, I got inspired by a Southern Living article and decided that one day we would have fully edible landscaping. A fence of grape vines, fresh herbs in lieu of flowers, a perfectly distressed farmhouse table under a peach tree for shade...you get the picture. Then we actually attempted our first garden an realized this whole vegetable growing thing isn't as easy as it looks. I think our yield was 4 peas, 3 tomatoes and maybe one oblong cucumber? Four years later, we're just happy to finally have more grass than weeds. To our surprise, this year our garden has been mildly successful. Apparently, sunlight and water help. Who knew? We've had tons of heirloom tomatoes, a few Japanese eggplants, lots of basil and more zucchini than I know what to do with. One thing I've learned from our successful turn at gardening - sometimes the bounty of summer produce can be overwhelming! When you know how much work has gone into growing a single tomato, the last thing you want to do is waste it. Here's a guide to summer produce so you can make the most of perfect, in season fruits and vegetables! BERRIES // Store loosely covered with a dry paper towel in the refrigerator and eat quickly as berries are highly perishable. Freeze clean berries in a single layer then transfer to a zip top bag for storage. CORN // The sugars in corn quickly convert to start, so it's important to eat corn quickly after harvest. You can slice the kernels off the cob and freeze. CUCUMBERS // If unwaxed, cucumbers can get slimy and go rotten quickly, so wrap with a kitchen towel and refrigerate. EGGPLANT // Look for eggplant that is heavy for it's size and springs back when pressed. Refrigerate until ready to use. MELONS // Look for melons that are heavy for their size. Cantaloupes and honeydew should smell sweet when ripe. Watermelon is ripe when the pale spot on it's rind is a creamy yellow. PEACHES // To ripen a peach, store it at room temperature on the counter, stem side down. To further speed up ripening, store it in a paper bag where the trapped gasses will help ripen the fruit. OKRA // Look for small okra, less than 3 or 4 inches long. Store in a paper towel or paper bag in the refrigerator, as it will wilt or dry out if not not kept in breathable environment. PEPPERS // Peppers do well in the freezer. Chop and freeze in a zip top bag until ready to use. SUMMER SQUASH // Smaller squash between 6-8 inches taste the sweetest. Squash doesn't freeze well, except if you grate it first. Grated squash can be mixed into stir fries, pasta sauce or used in baking. TOMATOES // To ripen tomatoes, place in a brown paper bag with a couple holes along with an apple. Never refrigerate tomatoes, which ruins their flavor. In a large bowl, mash chickpeas with a fork or potato masher until smooth. Mix in almond meal, zucchini, onion, egg, garlic and salt until well combined. Spray a baking sheet with olive oil. Form 12-16 golf ball sized balls and place evenly on the baking sheet. Spray the tops of the balls with olive oil. Place in the oven and bake 20-30 minutes, flipping halfway, until golden brown. While zucchini balls are baking, make the salad. 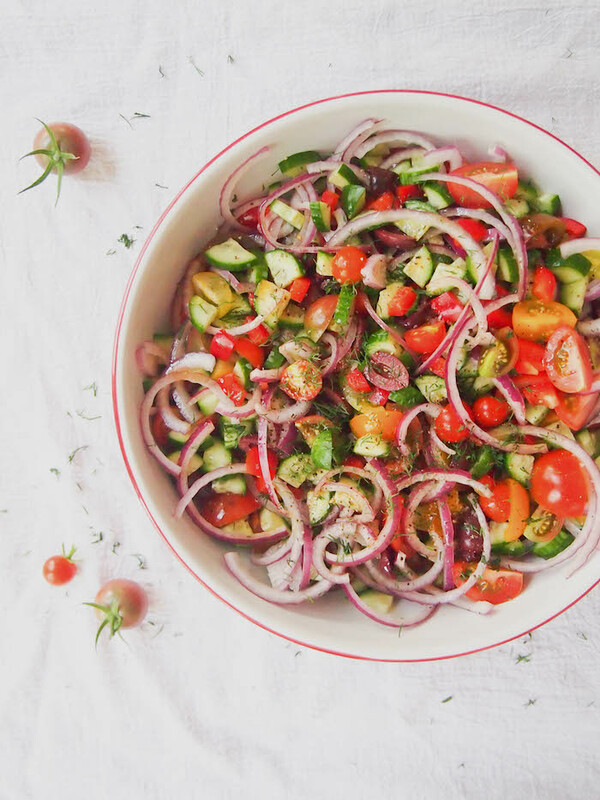 Toss cherry tomatoes, cucumber, bell pepper and olives together in a large bowl. Drizzle with olive oil and vinegar. Season with sea salt and pepper. Toss to combine. Garnish with dill.